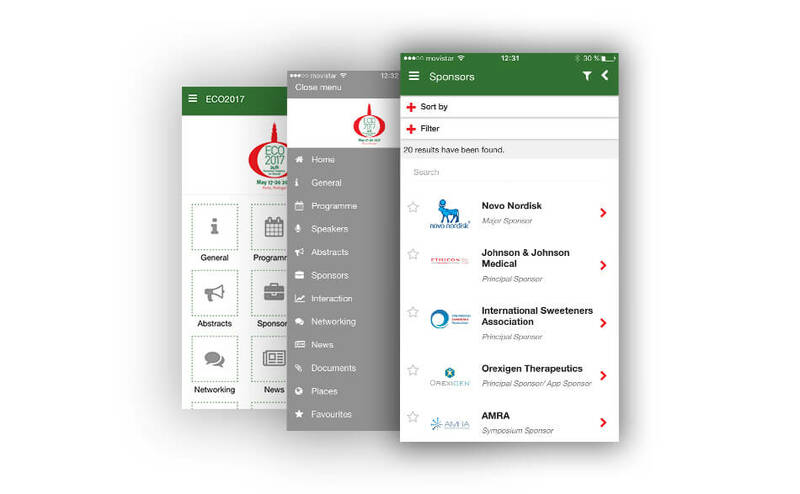 App developed for the Congress ECO2017, the 24th European Congress on Obesity. It took place in the city of Porto, Portugal. The meeting was celebrated from 17 to 20 May 2017 at the Alfândega Congress Centre, a former Customs House located in Porto’s historic city centre. The Alfândega Congress Centre was awarded “Best Meetings and Conference Centre – Europe 2014” by Business Destinations. We had the pleasure of developing the congress app. The app contains all the information about the event, the best way to offer updated information to the attendees. General information. Include key information about the event: website, location, about Porto, committees and about EASO. Programme. The full agenda of activities and sessions. Speakers. List of speakers with relevant information to their organisation, job title, email, biography, social networks, and more. Abstracts. Scientific communications of the event. Sponsors. Shows the relationship of exhibiting or sponsoring companies, including the most relevant information, their logo, contact details and social media links. Interaction. Walls, votings and surveys. Networking. App registration, list of attendees, chat an social networks. News. List of news related to the event. Documents. List of pdfs related to the event. Places. List of places of interest related to the event. Favourites. It allows event participants to highlight content as favourite. Gallery. Images of the event. Contact. Form through which users can use to make direct comments or suggestions to organisers from the app.